For those of you a little far away, let me fill you in on the significance of each image to Rhode Islanders. Del’s is a special lemonade native to RI that features lemon bits and shaved ice. We are obsessed! This is what you’d buy your kid after a ball game. Our state bird is the Rhode Island Red Chicken, hence the bottom illustration, but a very close second would be the seagull. There everywhere and personally, my favorite bird. My two little ones have already started surfing. I only thought it naturally Santa would too! The Big Blue Bug is a Providence land mark. NE Pest Control put this 20ft bug on top of their building years ago and everyone on the highway looks forward to passing it and checking out what silly adornment they’ve attached to the bug. Christmas is always Rudolph, but this summer the bug was sipping an Awful Awful which is another RI specialty. That brings me to lobsters or as the locals call them “lobstas”. It’s just not summer without hitting the docks and picking up lobstas right off the fishing boats. Speaking of fishing boats. I added some Christmas lights to a lobster boat. 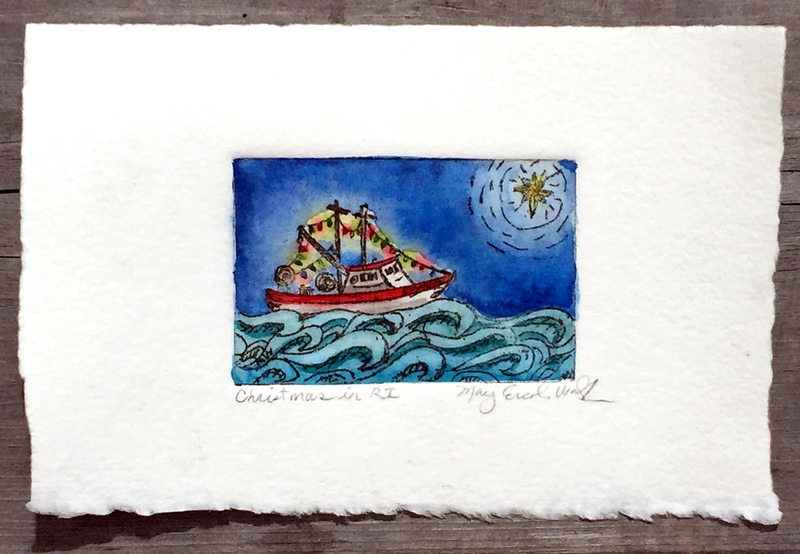 When you look out to sea, you can always spot a lobster boat. Even at night sometimes you can see their lights. It also reminds me of Block Island because they do a Christmas boat parade where all the owners decorate their boats. It’s an awesome sight to see! 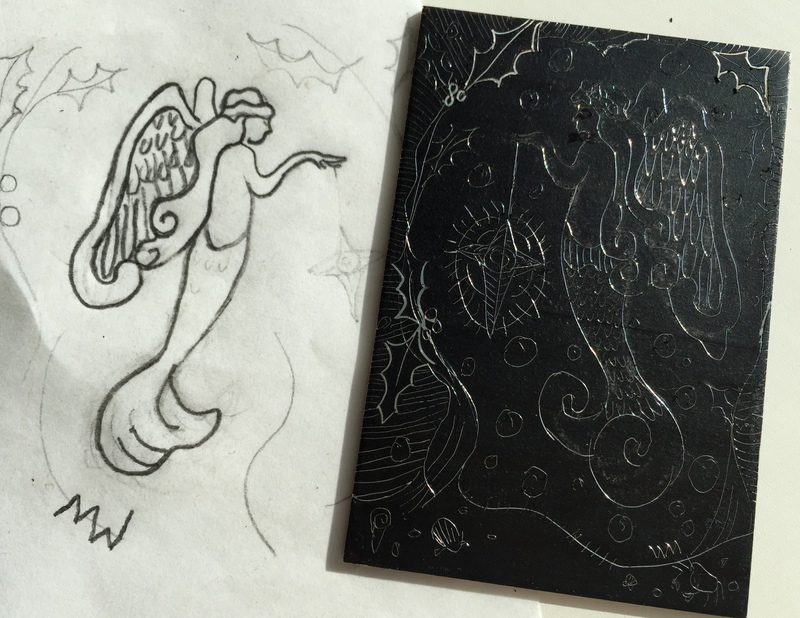 My final etching is of an angel or should I say mermaid? It’s a little nod to Christmas in a maritime town. I also thought of the angel who pointed the three kings towards the star of Bethlehem. Hmmm…this angel might guide them with her siren song …grrr! …oh yeah, that reminds me …back to work! 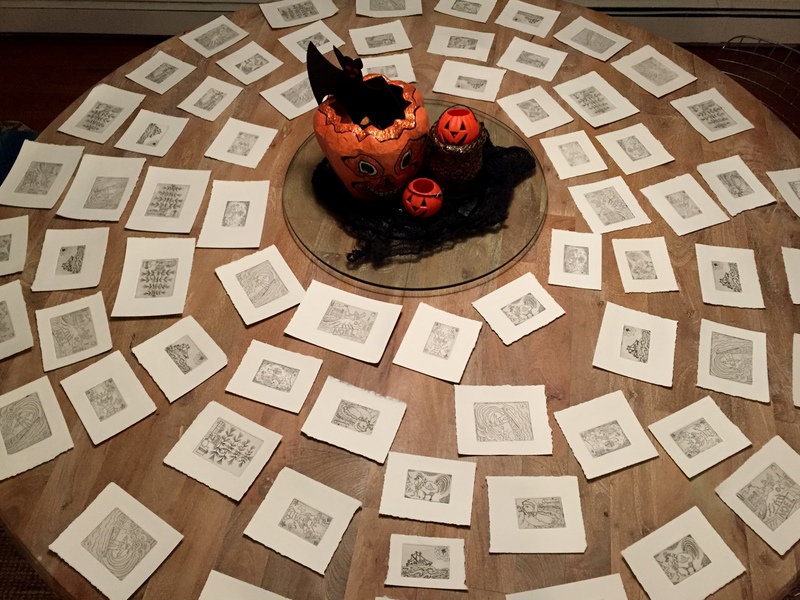 60 Prints in 6 Hours! My arm is throbbing from pulling the prints through the press, but I had a productive day! 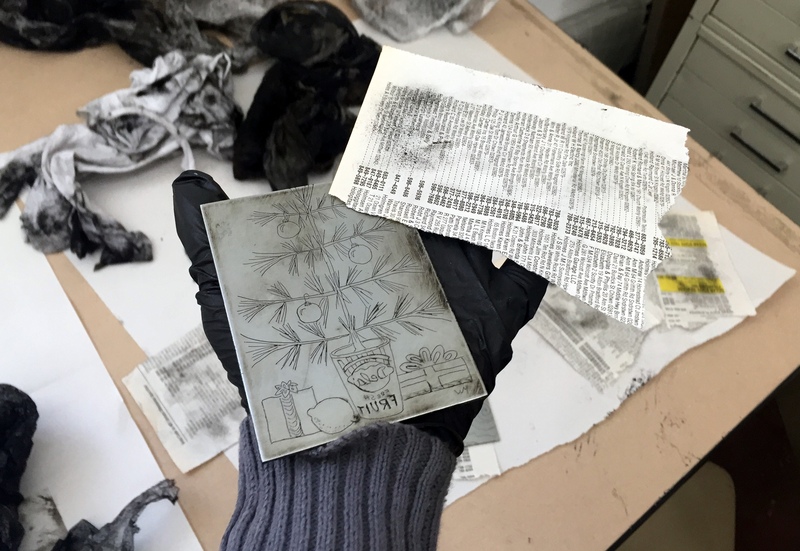 Not everyone is familiar with the old ways of Intaglio print making so today I will show you the printing process. 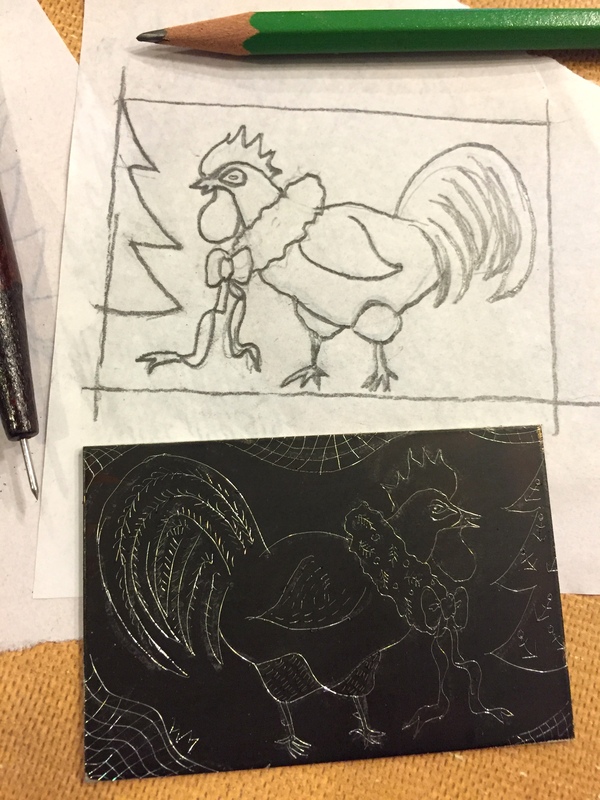 Keep in mind hours have already been spent treating and etching the plate – this is just the inking process! 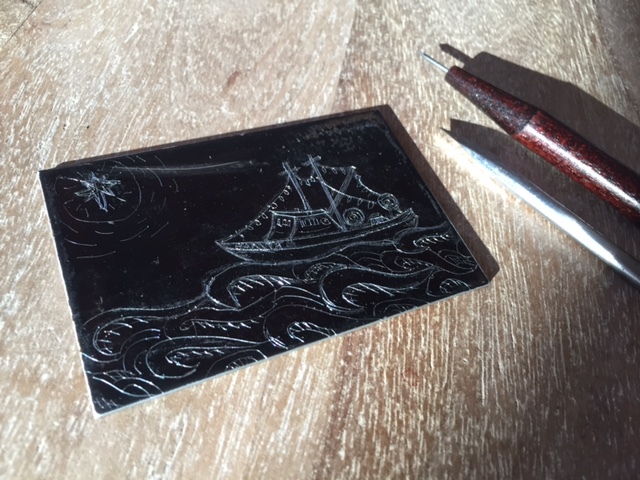 First you take a rubber squeegee and push the thick ink into the lines of your drawing. You need to push the ink into the grooves from all 4 directions. Next you take a special fabric called a tarlatan and you rub the plate in a clockwise direction. 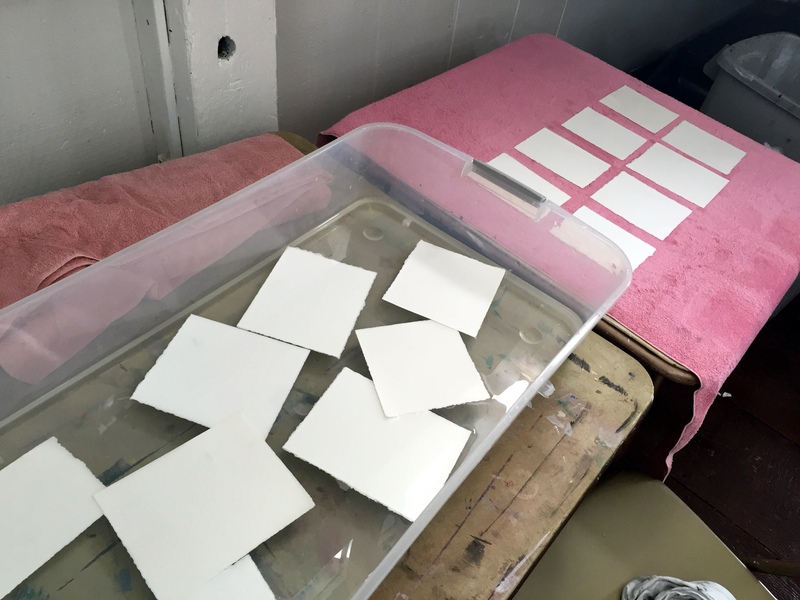 This removes excess ink while rubbing desired ink into the plate. It takes quite some time to carefully remove unwanted ink. At this point as hard as you worked, there is still a film of unwanted ink. You now very quickly, in a circular motion, rub the plate with newspaper. It almost feels like a heated friction. You are lightly skimming the surface to remove the last of the unwanted ink. If you are good you are still keeping the ink in those lines… we won’t talk about getting good…there’s lots of trial and error! 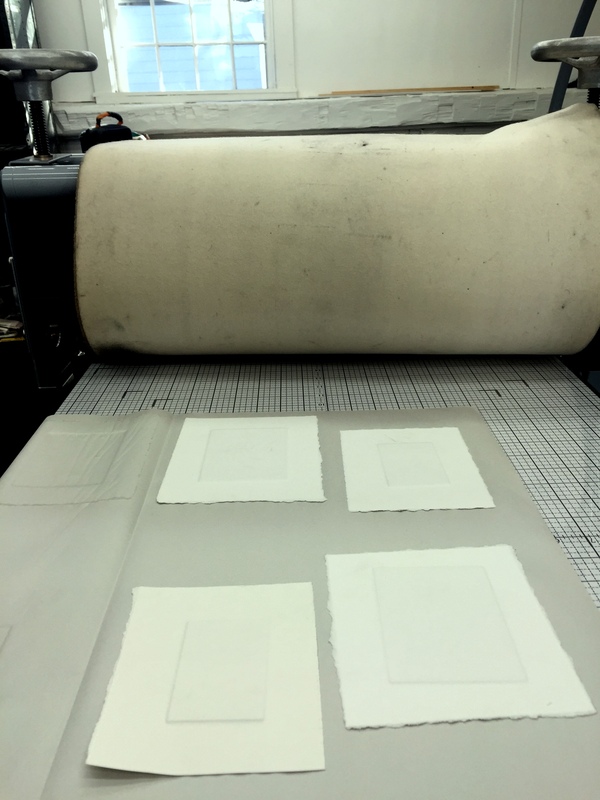 The paper has needed to soak in water for 20 min – to an hour so that the metal plate will not tear the paper when squeezed through the press. 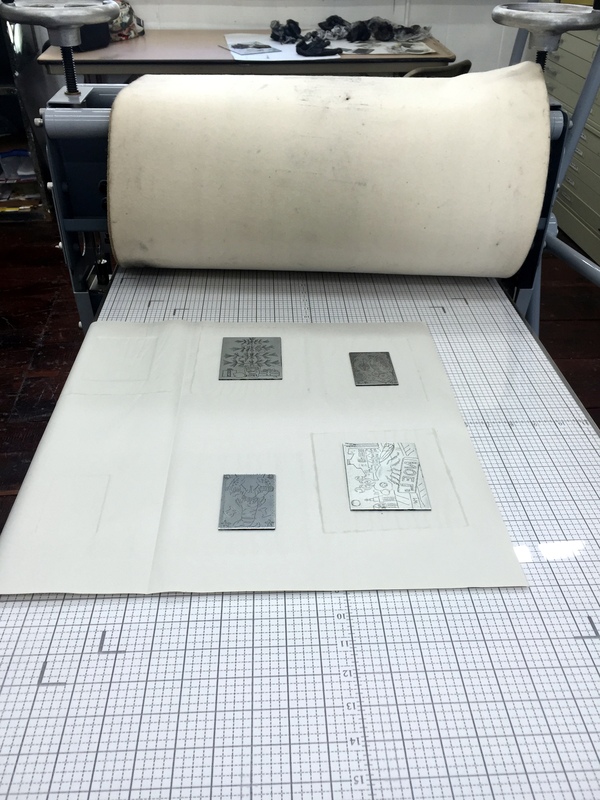 You put newsprint above and below your plates and paper. This keeps the messy inks off your press. 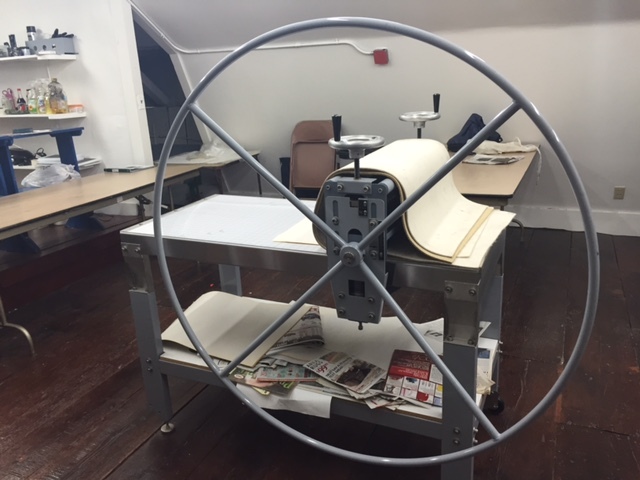 In this photo I have already put the paper and blankets down on the plates, rolled the press over it and then opened it up to see the plate marks on the paper. Plate marks are the creases caused by the force of the rollers when metal meets paper. This is how you can tell it’s a real print and not a photocopy! 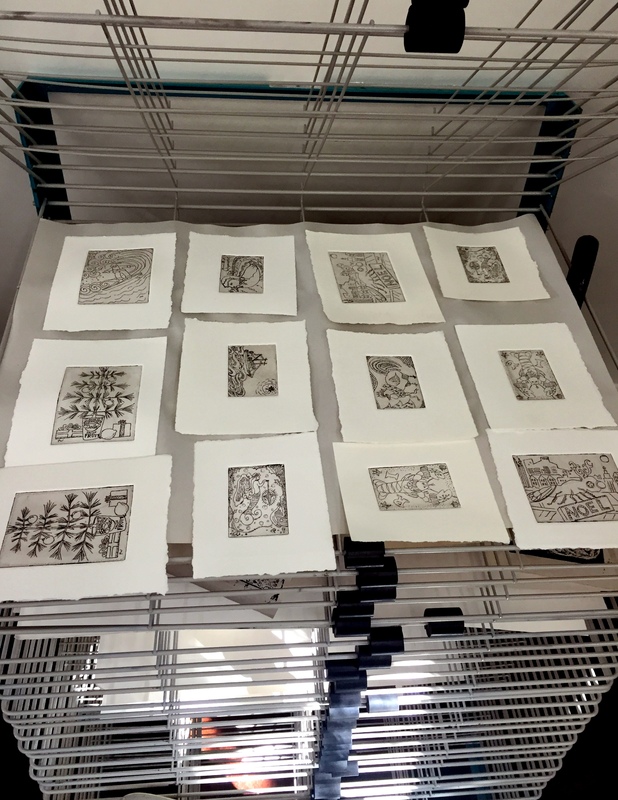 Alas the new prints are left on a rack to dry. 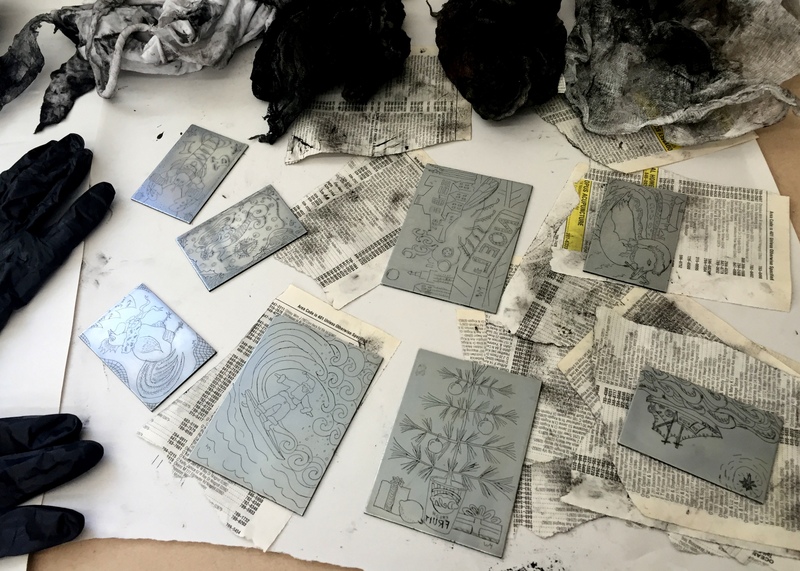 All in all, I am astounded at how labor intensive print making can be. We take for granted our new electronic friends spewing out images at the press of a button! But there is a difference. It’s how you feel when you lift the printing blankets and flip your piece of paper over to catch first glimpse of your print. It’s thrilling! And it really looks hand crafted. 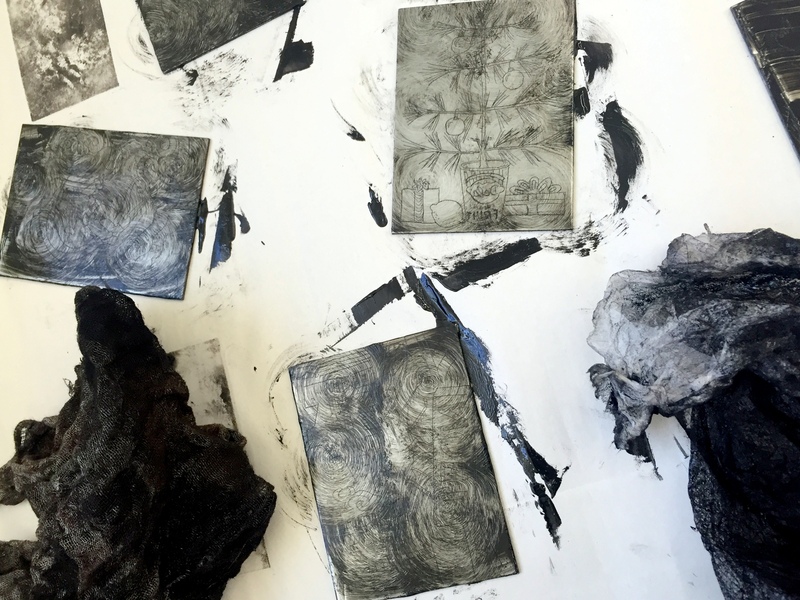 Going through the entire printmaking process allows you to connect with the artisans that came before you. The true work involved gives you new-found respect for their advances and artistry. 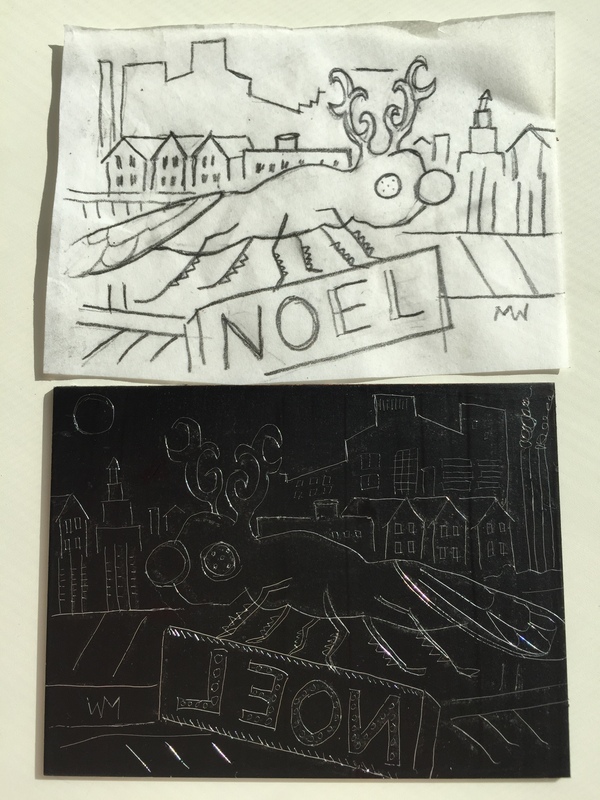 Here are more Intaglio etching plates and their sketches. All following the theme “Christmas in Rhode Island”. Have you heard of The Big Blue Bug? 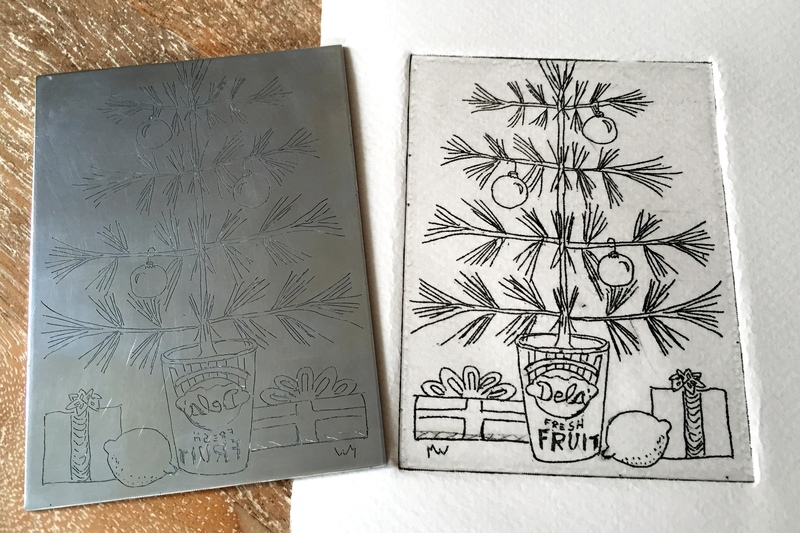 As a gift to myself, after my 365 Creativity Challenge, I bought a small printing press and some etching needles. I had never done it but wanted to desperately. 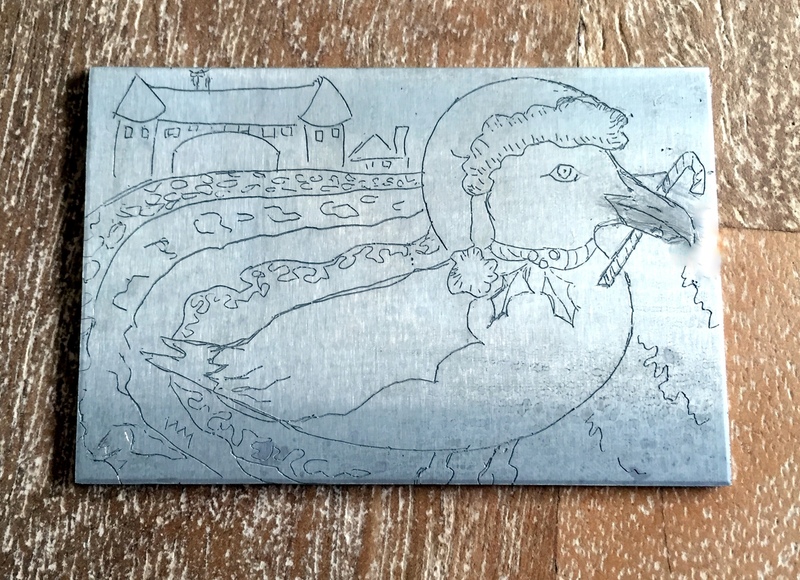 Well, the box came and I went to the library and grabbed a ton of books on etching. The books might as well have been written in Greek because I could not figure out what they were talking about! Next I went on You Tube. I thought seeing might be the answer. Nope too confusing. So I dropped the press box down in the basement and went on with life. I got a brochure in the mail which of course opened to the page “Intro to Intaglio Print Making”. It had “SIGN FROM THE UNIVERSE” written all over it. 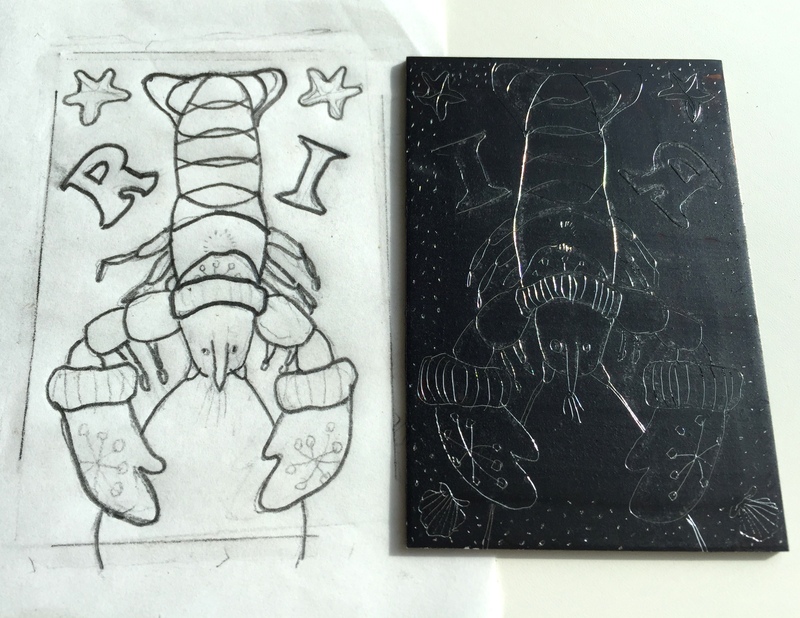 Ok not really, but it started in 2 days and if I jumped on it, this could be my opportunity to try to understand how Intaglio etching worked. So, I went for it! Dear me, there are SO MANY steps that go into this process. No wonder I couldn’t figure it out! I actually needed a human being to run through the process and then re-run through it 5 more times before my brain could even process it all. 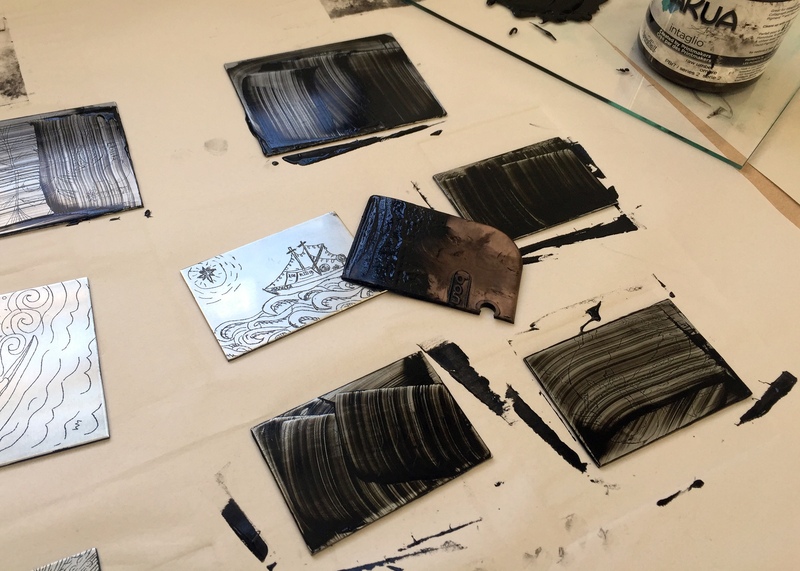 In a nutshell, you take a zinc plate, you paint this toxic goo on top of it, you then draw backwards with sharp needles into the painted surface, following that you drop the plate into an acid bath and carefully rinse off the acid. Any place the surface was scratched then gets eaten with acid. From there you take turpentine and remove the toxic goo from the top and then you can start the next step, loading the plate with ink and running it through the press. The inking has so many steps in itself that I shall share that with you on another day. 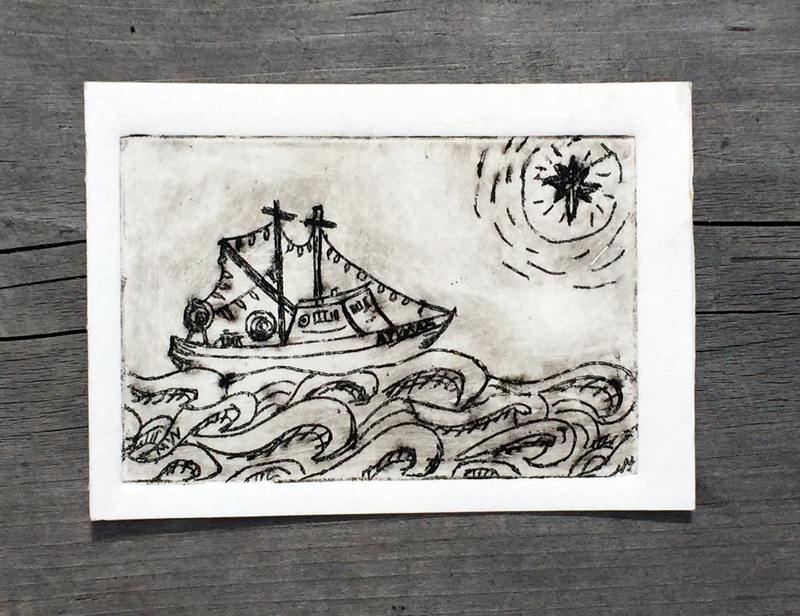 All told, I am working on a bunch of tiny 2″x3″ zinc plates and plan on making an entire collection of small prints titled “Christmas in Rhode Island”. This was my first attempt and the only one I have had time to pull a print of. The black and white is what you get, but being a color addict, I plan on water-coloring them. I think the effect is beautiful. This is a lobster boat with Christmas lights. Here is our state bird the “Rhode Island Red” decked out for Christmas. And of course I had to do a seagull by the Narragansett Towers. This week I will pull prints of the two birds. 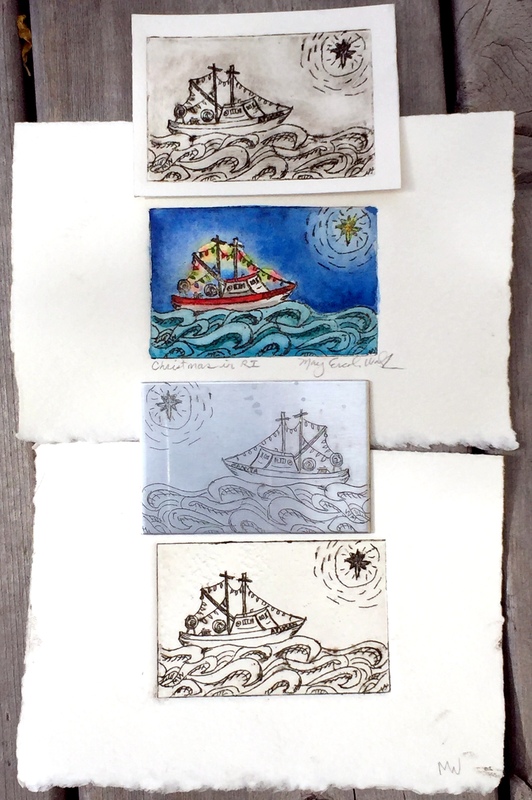 I also hope to create two more whimsical plates in this series. I shall keep you abreast of my progress. Tally-ho or shall I say Intagli-ho!